It has been a busy offseason in Atlanta. The Dream have new leadership at the top in new general manager Chris Sienko and head coach Nicki Collen. They have a returning four-time All-Star and perennial MVP candidate in Angel McCoughtry. They made a pair of impact free agent signings in guard Renee Montgomery from Minnesota and forward Jessica Breland from Chicago. Montgomery and Breland were two of the most highly sought-after free agents, so the Dream snagging both makes them a clear winner this offseason. Both will help the Dream improve on their league-low 29.1 percent 3-point shooting as Montgomery shot 35.8% from beyond the arc last season and Breland connected on 38.1% from three as she continues to expand her range. Breland will be joined in the frontcourt by Elizabeth Williams, who signed a multi-year contract to remain with the Dream after two seasons in Atlanta. 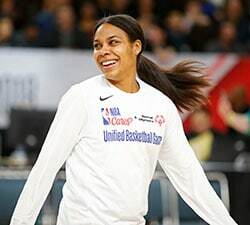 Williams was the WNBA’s Most Improved Player in 2016 and an All-Star reserve in 2017. 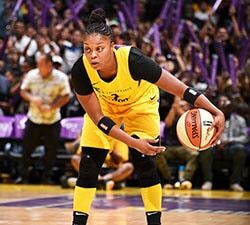 She was joined on that All-Star team by the backcourt of Layshia Clarendon (second in the WNBA in assists at 6.6 per game) and Tiffany Hayes (career-best 16.3 points per game while filling the scoring void left by McCoughtry). The challenge coach Collen and the Dream face is bringing McCoughtry back into the mix, while not sacrificing the gains that other players made in her absence. McCoughtry is one of the top scorers in league history (she has the fourth-highest career scoring average at 19.5 points per game) and will help boost Atlanta’s 10th-ranked offense from last season (97.0 points per 100 possessions). The Dream have only one sub-.500 season with McCoughtry on the roster since she joined the team in 2009. How will she be after a year away from the game? Will she show any rust? 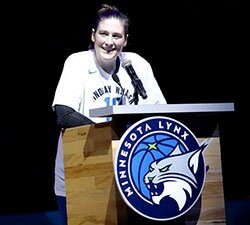 Or will she be well-rested and ready to dominate the game on both ends of the floor like she always has? After a solid offseason, the Dream enter the draft with two picks (Nos. 16 and 27 overall) and will be the second-to-last team to make their first selection on Thursday night. With those picks, the Dream can always look to add more shooting to the roster, as it all just depends on which players fall to the middle of the second round.